The Delta area is home for a free-ranging bison herd that numbers over 400 animals. There are also some privately owned animals in the area. Bison are long-time residents of Alaska, and scientists believe they were at one time the most common large land mammal in the state. The last of the indigenous bison died about 500 years ago, perhaps due to climatic changes. Alaska’s present day wild bison herds originate from a 1928 transplant of 23 bison from the National Bison Range at Moiese, Montana, to what is now the Delta Junction area. This area was chosen because much of it had been burned by wildfires and was vegetated by lush native grasses. Historic reports indicate that the original plan was to transplant something a little easier for sportsmen to handle than a moose – like elk. While now immensely popular, bison certainly aren’t any easier to handle! Conditions were so favorable for the initial herd that by the 1950’s the herd had grown to about 500 animals. Availability of forage and a program of controlled hunting has now stabilized the herd at about 375 to 450 animals. Over the years, the bison established the migratory pattern of summering and calving along the Delta River south-southwest of Delta Junction and wintering in what is now the Delta agricultural area. Each year, the bison move back into the farming area in late August and September and create problems for farmers who are then in the middle of harvest. The conflict has existed with varying degrees of severity from the 50’s, with the first homesteads, to the present time, with large-scale agricultural development. The Delta Bison Herd (DBH) is managed by The Alaska Department of Fish and Game (ADF&G) according to the Delta Bison Management Plan. The plan is updated every few years through a cooperative process involving the Delta Bison Working Group. The Working Group is an advisory group that includes hunters, farmers and other people interested in the bison herd. The process also involves state fish and game advisory committees and other interested members of the public. The main focus of the plan is to identify management actions that can minimize the damage caused by bison to agricultural operations in the Delta area. Because the area’s native bison food supply cannot support a larger herd of bison, and because more bison would cause more problems for farmers, the state annually issues permits for hunting bison as a means of limiting herd size. In recent years, 50 to 100 permits have been available each year, and it is the most popular permit hunt in the state. In recent years more than 10,000 applications have been received for permits. For summertime visitors, a good spot to see bison at a distance is the turnout at Mile 242.5 on the Richardson Highway, about 20 miles south of Delta. The turnout is located along a ridge just before the road descends to the Delta River bottom at Donnelly Creek. It is necessary to use field glasses or a spotting scope to see the bison, as they are two to three miles away at this point. Fall and winter visitors can often see bison on the Bison Range or in the Delta Agricultural Project area. Contact ADF&G for more information on bison, bison hunting and current viewing opportunities. 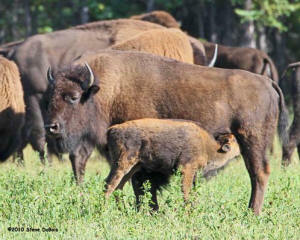 There are also now a few small privately owned herds of bison in the Delta area. 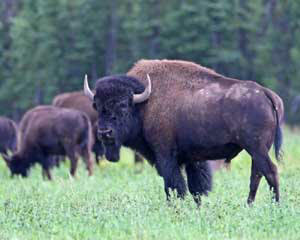 Bison are one of the few game animals that may be legally owned by individuals.